The association’s next major activity is the Annual General Meeting to be held in conjunction with a dinner at the United Service Club on the evening of Friday 12 September at 1900 for 1930 hrs. The AGM Dinner is always a thoroughly enjoyable evening and it is hoped that a large turn-out of members will be able to make it on the night. As in previous years, dress for the evening is not mess dress but jacket and tie or equivalent. The cost for a 3 course meal including wine, beer, soft drink and port.is $60. A reply slip is provided later in this newsletter. Also included is a committee nomination form. Nominations can of course also be taken from the floor on the evening but it would facilitate the smooth running of the meeting if we had names aginst most slots before the actual night. I urge members to consider nominating. Our guest speaker for for the evening is the Principal Chaplain of the Army (Brigadier equivalent) Len Eacott who, prior to being ordained, was a Reserve Infantry officer and served as 2IC QUR and as the foundation secretary of the QUR Association. Wanted: a new editor for this newsletter. See the committee nomination form to provide an outlet for your latent literary talents. Dr Neil Heather advises that a former member of QUR featured in the Australia Day Honours List. Professor Robert Menary, currently Professor of Horticulture at the University of Tasmania Hobart, was awarded an OAM for services to horticulture. Bob Menary was a second intake National Serviceman in 1952 and subsequently served in QUR for about a decade, first as part of his NS obligation then as a CMF volunteer. He was commissioned in QUR around 1954. 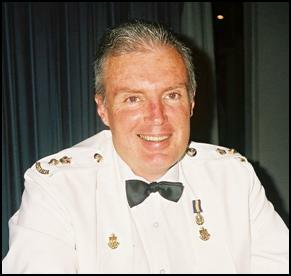 At a recent 9 RQR CO’s Dinner, Association member Major General Steve Golding was farewelled on the completion of his term as the Regimental Colonel of the Royal Queensland Regiment. During his address to the dinner he announced that he would be succeeded in that role by Brigadier Rod Hamilton, also an Association member and 2IC of the Regiment during Lieutenant Colonel Brian Venz’s time as Commanding Officer in the mid 1980s. Peter McCann was commissioned through RMC Duntroon originally into the RACT. After leaving the ARA (now the full-time component) as a Captain, he served for a time with Norforce having changed corps to Infantry. On moving to Brisbane and being promoted to Major he served as a Company Commander in QUR first under Brian Venz and then under the humble editor of this newsletter. Following his QUR service he was promoted to Lieutenant Colonel at 1 Training Group. Last reports to hand show that he has moved back to the full-time component of the Army and accepted a reduction in rank to be employed in an SO2 slot at Headquarters Training Command in Sydney. It could be said that Peter’s military career demonstrates the opportunities for flexible movement between full and part-time service that characterizes the modern Army. Similar snippets for this “Where are they now” segment of the newsletter would be gratefully received. It seems only yesterday that I assumed command of the Regiment yet three months have flown by. The Regimental Dinner was held on Mother’s Day weekend and at the Anzac Officers Mess at Enoggera. It was a great night with many of the attendees taking advantage of the bus back to the regiment to have a cleansing ale or two. As I said at the dinner the regiment is in good shape as witnessed by the students taking out 4 of the top 5 spots at the graduation in February. It really was grand as the incoming CO and I am certain it was also for Peter to hear the names being read out and QUR following that pronouncement. I believe given the fine standard of cadets and the standard of the instructors that we have a great chance to repeat the event next year. The big news is that QUR as things stand at the moment will take under command the Townsville and Darwin based RMC companies in March 2004. The other news is that a decision will need to be made over the Regiment’s long term home in the next year. Witton Barracks is down for disposal in 04/05 so we need to determine our “user” requirements and get facilities to replace those lost when Witton disappears. It was good to see such a large attendance on Anzac Day at the Toowong Monument. With large numbers coming back to the regiment it reinforces our place in the local community. The address by Capt Mick Stone I think was a highlight of the morning and certainly seemed to come from the heart. The dedication of the staff within the unit can be seen by the large numbers who routinely are now surpassing 70 days service each year. It is a sign of the large workloads of the Reserve and the increasing part we play in supporting the full-time Army. It is also a sign of how hard it is to get and keep talented SNCOs and Officers with the increasing demand of their civilian careers that we are routinely undermanned and must beg or borrow people to help our courses. By the time you read this we will be welcoming our newest 20 cadets starting in the July camp. This initiative will, I’m sure, make it easier to recruit throughout the year and avoid the clash with ADFA and RMC which inevitably happens later in the year. Many attendees at this year’s Anzac Day service at the Toowong memorial were very impressed by the address delivered by Captain Michael Stone. The text of the address is reproduced below although it should be noted that quoted references have not been referenced in this version. The first battalion ashore at Anzac cove was the Ninth Battalion, Brisbane’s own. Young men from this very district trained at Enoggera that received their baptism of fire on a remote beach in a foreign land called turkey. These are the words from an Unknown Soldier of a coy, the fighting ninth. With as little noise as possible, the boats left the side of the warship, and no one who was in those boats will ever forget the silent cheer the British tars gave to the Australians as the boats drew away. A frantic wave of their arms, nothing more, but enough to assure us that the men of the British Navy were proud of their Australian brothers in arms, the 9th Battalion of QUEENSLANDERS! We were in the first boat and about fifty yards from the landing when a light flashed from the fort of Gaba Tepe, a whistle shrilled out upon the cliffs, and the rattle, clatter and boom of machine gun and shrapnel broke upon us from the shore. Bullets splashed all around the boats and tore through the woodwork. The pack upon my back was torn with bullets, but I was untouched. We pulled with all our might for the shore; men cried, laughed, prayed, swore, and still the bullets tore through the boats, throwing all into confusion. Those that were able sprang into the water, helter skelter out of the boats. The water was up to our necks, but stumbling and wading we reached the shore, and rushed up for any cover that was available. In the darkness before the dawn, men gathered on the beach beneath the cliff. Packs were thrown off and bayonets fixed. All this time on the cliff above us had been pouring a hail of bullets into the landing parties. Dr Butler had lost some of his stretcher bearers in that deadly fire, and this made him very angry. ‘Come on men; we must take that gun’ he cried and started climbing the cliff, his revolver in his hand. We stormed up the cliff behind him. Sergeant Fowles and Patrick Corney were on either side of me as we climbed the cliff, and both were shot dead. We rushed the gun and bayoneted the Turks who formed the gun crew. Smashing the gun so that it could not be used again, we dashed forward to storm the next trench, the line growing stronger as the boys rushed up to reinforce. On and on we went right up the cliff to the summit, where we had to pause for sheer want of breath. Looking below, we saw the ships shelling the Turkish positions, while the Turks replied by shrapnel over the landing place. Boat after boat was smashed under our own eyes and the occupants mangled or drowned. The sight maddened us. ‘On Queenslanders!’ came the cry, and with our bayonets fixed we rushed for the Turkish position. Time dims the memory of ordinary events, but not great events. In a nation's history, great events - whether in peace or war - live in our memories regardless of time. They are deemed great not necessarily for what they achieve, nor for whether they are reckoned to be victories or successes. Rather, the great events are distinguished by the quality of the human endeavour they call upon, by the examples they create for ordinary men and women, and by the legends they inspire. So it is with Anzac Day. On 25th April 1915, 16000 Australian and New Zealand troops surged ashore at the foot of rugged cliffs on the Dardanelles peninsula in turkey. The cream of the Australian and New Zealand armies, all of which were volunteers, committed themselves with no hesitation about the nobility of their cause, and fought with great courage, skill and audacity. In the eight months which followed their first landing, some 50,000 Anzacs were committed to the battlefront, alongside 36,000 British, French and Indian comrades. When the last of them were withdrawn as winter set in, more than 11,000 Anzacs lay dead, and with them many more allied and Turkish soldiers. By their courage, comradeship and sacrifice, the Anzacs set standards that inspired their countrymen for generations to come. The legends they established gave fresh voice to new feelings of national pride in our young nation, and the news of their suffering, on reaching the homes of anxiously awaiting families, brought people together in ways they had not known before. Every year on the 25th of April, since 1915, Australians at home and abroad have gathered to commemorate not just those Anzacs who died on that day, but every one of our service men and women who have died in war. We remember on this day those who served in World War I and II, Korea, Malaya, Borneo, and Vietnam. As well as more recent operations in Cambodia, Somalia, Rwanda and Afghanistan. We also pray for those soldiers currently serving on operations in Iraq, East Timor, Bouganville, Sinai and other operations worldwide. But it was Gallipoli which gave us pride, not in war, but in the knowledge that Australians, put to the test, would not fail. This spirit and tradition sustained our forces in many later battles and trials, and in many ways, sustains us now. Gallipoli and all subsequent conflicts involving our two nations. The men and women who forged the Anzac spirit made sure that those who led them earned their respect. They all understood the values of independence, freedom and fairness and - above all - possessed a willingness to defend these things if need be. Because freedom only survives as long as people are willing to defend it. That is the spirit Anzac handed down to us. If we lose that Anzac spirit, we lose all. Lives were spent in defence of a characteristically Australian belief. It is not a belief you find recorded in the histories of the war, it has no monuments to preserve it, except our national identity and spirit. And it is this: being an Australian means that we believe happiness is the right of all people in this country, a deep conviction that there is common good. Future generations need to be reminded that happiness has a price. For surely if happiness is the product of freedom, then freedom is the reward of courage. In order to defend this belief, we must never decline the dangers of war. To do so would diminish the gift of these men and tarnish their memory. Instead, we should feel gratitude for the gift of our present happiness and, in doing so, we will keep bright the memory of those lives. The Australian soldier today strives to uphold these values. They do not choose their mission, nor their fight. They are proud to be of service to their nation. To defend what is right and what their country asks of them. As we stand here today soldiers stand watch in Iraq and East Timor. Lonely dark places in the world: a long way from home, from freedom and happiness. As a forth generation infantryman, i am proud of my heritage. I have been given the opportunity to visit the shores of Gallipoli and can appreciate the challenges my ancestors faced. I have also been privileged to have led soldiers on operations, young men, bearing greater loads and responsibility then could be asked of them at home. The soldier is but an ordinary man called upon to do extraordinary things. So here we stand today, along with thousands of others in cities and townships throughout Australia, to honour great men and women and a great tradition. We gather, as we shall always gather, not to glorify war, but to remind ourselves that we value who we are and the freedoms we possess, and to acknowledge the courage and sacrifice of those who contributed so much in shaping the identity of this proud nation. We will remember them, lest we forget. q I will be attending the Association’s Annual General Meeting Dinner to be held at the United Service Club, Wickham Terrace, Brisbane on the evening of Friday 12 September 2003 at 1900 for 1930 hours. q My cheque for $60 payable to the QUR Association is enclosed.